Thanksgiving is a big holiday at my house! I love the magic of autumn leaves falling and the crispness in the air. I especially enjoy savoring all of the extraordinary foods prepared with traditional recipes passed down to each generation. Grandmother Norton’s dressing was always a favorite. My all-time favorite was her icebox fruitcake; I still have her handwritten recipe. I cherish those traditional recipes, but I am always interested in the modern twists we can spin in our holiday staples. I don’t think I have ever met someone who hadn’t had a green bean casserole or two at their thanksgiving table. 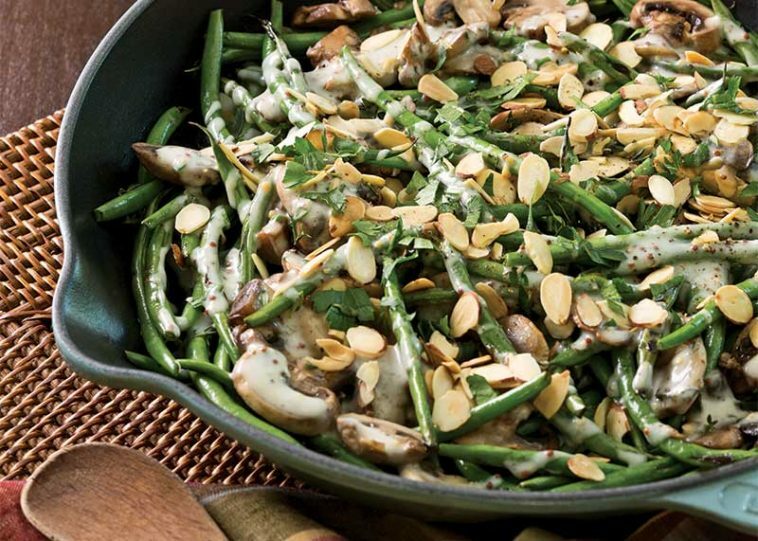 This year the marvelous Taste of the South team developed a wholesome spin on this holiday classic with their stovetop green bean casserole. The creamy sauce and tender mushrooms create a nostalgic flavor while the sliced almonds provide a light crunch. 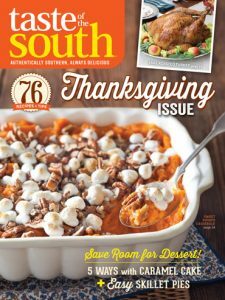 If you want more last minute side dish inspirations, checkout Taste of the South’s Thanksgiving issue. I hope you enjoy the recipe, and that you will use it to treat your family and friends to a glorious Thanksgiving! Bring a large pot of water to a boil over medium-high heat; add beans. When water returns to a boil, immediately drain, and transfer beans to an ice water bath to stop the cooking process. Pat beans dry. In a large nonstick skillet, melt butter over medium heat; whisk in flour. Cook for 30 seconds, stirring constantly. Whisk in milk and broth. Cook, stirring constantly, until thickened and bubbly, about 7 minutes. Remove from heat. Stir in mustard, 1⁄2 teaspoon salt, and 1⁄4 teaspoon pepper. Spoon into a small bowl. Cover and set aside. Wipe out skillet. Add 11⁄2 tablespoons oil to skillet, and heat over medium-high heat. Add beans, shallot, remaining 1⁄2 teaspoon salt, and remaining 1⁄4 teaspoon pepper; cook until crisp-tender, 5 to 6 minutes, stirring occasionally. Remove from pan. Heat remaining 1 tablespoon oil in pan. Add mushrooms, thyme, and garlic; cook until tender, 2 to 3 minutes. Add bean mixture, and toss. Spoon about 1⁄2 cup sauce over beans. Sprinkle with parsley and almonds. Serve with remaining sauce on the side. What is your favorite Thanksgiving classic? The green bean dish sounds delicious and one I would like to try. A favorite of my family is a wild rice casserole. It is one handed down from generations growing up in MN. Seriously, adding toasted almonds to anything raises it to special, no? If you want a lighter side with the vegetable, you can do this same recipe and just leave out the sauce, which seems like a relative of béchamel–yummy but a little heavy considering what else is on the table. Options, options. Love the Green Bean recipe, Phyllis. Had not thought of that icebox fruitcake recipe in years! Bet it could be made with a Gluten Free cookie and be a special dessert all would enjoy! Cornbread Sage Dressing is definitely the center of the feast with Deviled Eggs a very close second. Mother made a wonderful Minced Meat Cake that I keep trying to duplicate with mixed success. And her Chess pie!! Thanksgiving is so special. Add me to the list of readers who would like to have the icebox fruit cake recipe. Despite all the fruitcake haters in the world, a moist, rich cake full of candied fruit, nuts and dates (leave the bitter citron and peel out, please!) is at the top of my winter holiday treat list. I would love that fruitcake recipe too. I remember Mom making it but, oh my, where did the recipe go? Would love to have a recipe for icebox fruitcake. I remember them from my childhood but the recipe has been lost through the years. Thanks. Happy Thanksgiving to you and your family and staff. I do love all of your publications. I remember the time I read Southern Lady. My husband and I decided to drive back to North Carolina from Colorado so I shopped for magazines to read on the trip while my husband drove. I saw Southern Lady and was tickled pink that you were giving to us this very special magazine. I read and re-read it on the trip. It was just a week or so from Christmas and I was thrilled with what you had done. I was over the moon with the ideas you shared. It made my two day, long hours, trip go by so much faster. Being a Southerner, born and bred, my heart skips a beat anytime I see anything southern. 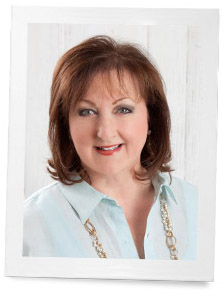 Thank you from my heart for making this Southern Lady feel special with each of your publications.